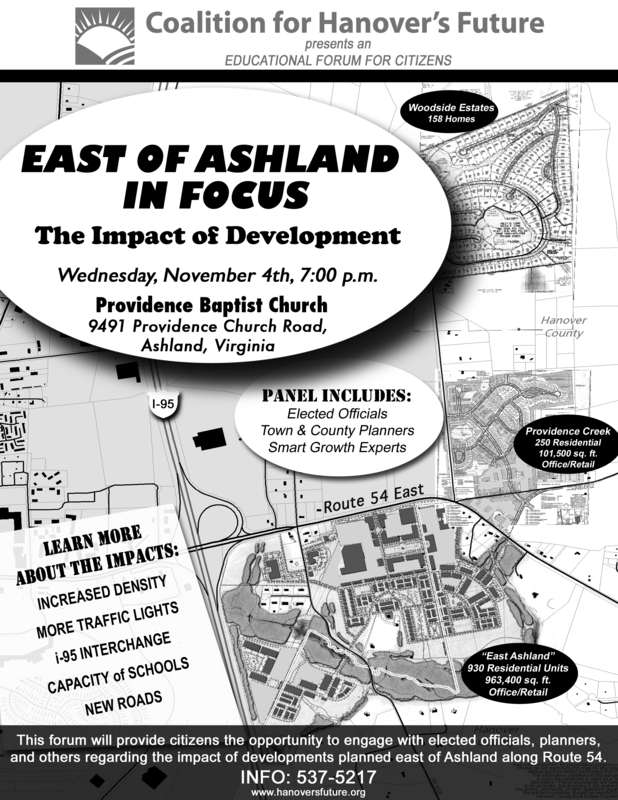 EAST OF ASHLAND IN FOCUS, Educational Forum, Wednesday, Nov. 4th! Please Join Us! The Coalition for Hanover’s Future (CHF) will host a citizens educational forum this Wednesday, November 4th at 7 p.m. at the Providence Baptist Church in Ashland. The forum will provide citizens an opportunity to engage with elected officials, planners, and a national expert on land use and transportation reform regarding the high density developments proposed east of Ashland along Route 54. Without a new and improved I-95 interchange, how will traffic volumes be managed and controlled? How many more traffic lights are planned? Will historic Providence Church Road be closed and thus force folks to drive through “Providence Creek” development to reach their church? A traffic impact study indicates seven traffic lights on Rt. 54 and a plan to close access to historic Providence Church Road from Route 54 (East) and reroute it. Traffic volume is estimated at 33,216 car trips during weekdayss and 35,216 car trips on Saturdays. Will Hanover County’s school system be able to handle increases in student enrollemnt. How much will all of this excessive growth, in terms of infrastructure and public services cost the taxpayer? When does green-lighting development become wreckless and irresponsible? How do all of these proposed developments preserve the quality of life for existing and future residents? How will these developments make quality of life better? Along with “East Ashland and Providence Creek” Short-Pump size growth, add “Woodside Estates.” “Woodside Estates,” now underway, will bring 158 new homes. “CHF is providing this forum so citizens will acquire the big picture regarding the impact of these large scale developments on their overall quality of life. The dramatic growth will bring a surge in traffic volume and congestion, and a significant increase in light pollution and impervious surfaces. The amount of infrastructure required, such as sewer and water, roads, schools and public safety, will increase and the cost is passed on to us as taxpayers,” said Pattie Bland, chair of CHF. The Wednesday night forum will be moderated by Sheila Sheppard, coordinator of Partnership for Smarter Growth. Presentations regarding the size and scope of the proposed developments will be made by planning staff from the Town of Ashland and Hanover County. Jurisdictions in which the developments will grow will be represented by Ashland’s Mayor and a Hanover County Supervisor. Trip Pollard, a nationally recognized land use and transportation reform expert from the Southern Environmental Law Center, will provide insight about the development and their impacts. Citizens will be able to ask questions or raise concerns with panel members following presentations. WHEN: Wednesday, November 4th , 7 p.m.
WHERE: Providence Baptist Church, 9491 Providence Church Road, Ashland. A community meeting on the MX zoning request by Lowe, Lowe and Woodside Partners is scheduled Tuesday, March 10 at 7:00 p.m. at Providence Baptist Church, 9491 Providence Church Road. The MX zoning on 63.4 acres would permit the creation of 232 building lots and residential units for a gross density of 3.66 dwelling units per acre, and approximately 130,000 square feet of retail and office space. Area residents have raised concerns of traffic routing and volume, as well as encroachment on historic property. The parcel, located in the Beaverdam district lies some 300 feet from the intersection of Woodside Lane and East Patrick Henry Road. WHAT: 63-acre wooded parcel bounded by Woodside Lane and Providence Church Rd. The DesignForum presented preliminary plans for developing this parcel to a small group of citizens, the county’s planning staff, developers, and an attorney. Those in favor of profiting from this development far outnumbered adjoining property owners and interested citizens. With approximately 12 adjoining properties, only THREE adjoining property owners declared themselves. One property owner was a developer who had attempted to develop Hickory Hill 20 years ago (he owns the cornfield parcel bounded by Providence Church Road & and Rt. 54). The design process took into consideration the preservation of wetlands and woods. Intentional green spaces were created, green space was not merely treated as what’s ‘left over’ after a parcel has been radically altered from its natural state. People – with 2.6 persons per household and 232 homes, the Providence Creek “village” would become home to 603 new residents (in addition to a number of people the shops might attract). Traffic: if you calculate at 8 vehicle trips per day (per household), Providence Creek “village” would add approximately 1,856 vehicle trips to traffic. A background traffic count was conducted over the July 4th weekend. Due to rising gas prices, there was less traffic and travel over the Fourth of July weekend. The design firm was asked if their traffic count will be reconciled to reflect this reality. Concerns about traffic generated the greatest amount of discussion. Due to future developments surrounding the area (Hickory Hill, East Ashland, and Woodside Lane), there will be many more cars and congestion. Concern was raised regarding the unsafe intersection where Providence Church Road and Woodside Lane converge at Routet 54. DesignForum proposed re-locating Providence Church Road so that it passes through the mixed use development and reaches Woodside, therefore a “T-intersection” would be created at Route 54. There was no mention of work-force housing. Tomorrow, Felts & Kilpatrick, the developers for the above referenced zoning request will hold a community meeting at 7:00 p.m. in the Board Room of Hanover County Courthouse, 7516 County Complex Road, Hanover, VA 23069. Felts & Kilpatrick will take this opportunity to present its zoning application and development plans to the public and Providence Church Road & Woodside Lane community; they will answer questions proposed by attendees. Everyone is invited to attend and participate. Please tell your neighbors about the meeting in case they did not receive this Notice. Please contact the Hanover County Planning Department (804-365-6171) should you have any questions.